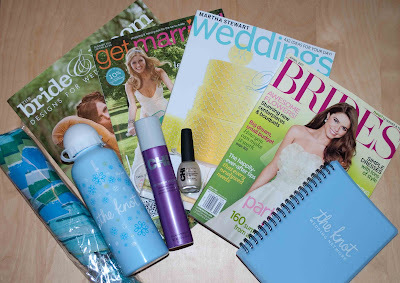 shop joielle: April Showers Bring Another Bridal Market Giveaway! April Showers Bring Another Bridal Market Giveaway! Julie and I had another enjoyable weekend at Bridal Market previewing the Fall 2011 line-up and scoping out potential new additions to our site. Market in April is always a little quieter, but the designers were clearly hard at work experimenting with new ideas and taking some fashion risks! We loved seeing more styles in Dessy Group's Junior Bridesmaid line, which we will be adding to our site in a few days! 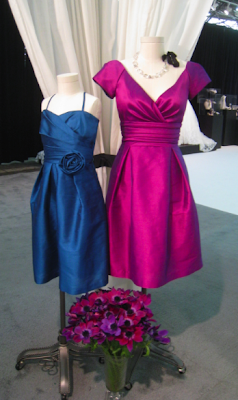 Here, an Alfred Sung junior bridesmaid dress is paired with one of the new Fall 2011 styles in dupioni fabric. Super cute! We also noticed a few trends that are leaning towards a flair for the dramatic. Time will tell if any of these will pique the interest of brides! Previously relegated to a shoulder or back, the bow is now taking front and center stage. Amsale makes a bold statement with an exaggerated bow detail on this silk dress, and Dessy's upcoming new Social Bridesmaid line will carry this satin style with a matching or contrasting bow option. It was refreshing to see some whimsical headpieces used to spice up runway shows. 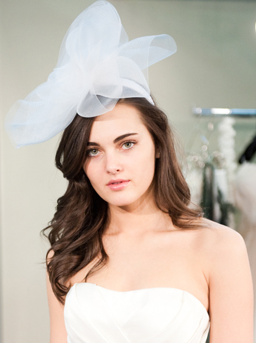 One of our designers, Malis Henderson also has picked up on this trend, creating large statement headpieces in different tulle fabrics as well as a beige hat veil. Lighter and softer than taffeta, this fabric is quickly moving up the ranks as a designer's new favorite material to work with. Shimmer satin is perfect if you want more of an iridescent shine, while still keeping a subtle look. It's sleek and clean, and perfect for an evening wedding. Above is a sneak peek of two styles from Landa Designs. 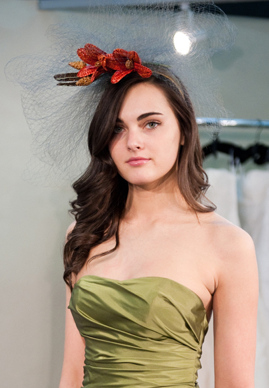 Any idea when the Alfred Sung Fall 2011 bridesmaid line will be available? I love the pink dress (in the picture with the junior bridesmaid dress) with the cap sleeves! Totally loving the shimmer satin. I could definitely see this being popular this spring/summer-- the fabric is really versatile no matter WHAT type of wedding you're having! Beach, church, field-- day or night, I think it would go well with all of it. @Shannon, they should be available to order in June, possibly earlier. please contact us at info@shopjoielle.com with your wear date so we can give you more details! I think all of those trends are going to be sticking around for a while, it seems several of the weddings I've gone to within the last year each incorporated those trends....big bow on the bride's gown, another with shimmer bridesmaids dresses, and a bride with a big hat instead of a veil! Apparently I have some fashion forward friends! Love all the new trends, but I think for my own wedding I'm going with all classic details. Fabric bows and the bold headpieces are all over the place, and I think they'll be around for at least two seasons. Not so sure about shimmer satin, though?!? Thanks for the giveaway!I am a sucker for bold head pieces.I think they will forever be in style.I love them.